The 2013 Imbalanced Draw: Who's Sorry Now? Before 2013 started I made an assessment of how kind the 2013 Draw had been to each team. For today's blog I'm going to reassess those impacts for each team, taking into account where they find themselves now on the competition ladder, what we now know about the relative strengths of each team, and what we know about the teams they've avoided playing twice. 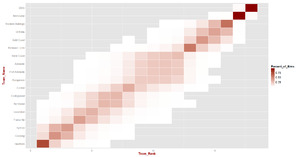 Using the same methodology and algorithm that I've been using to simulate the remainder of the current season, I have for this blog simulated the remainder of season 2013 including the 'missing' games, which are those games that would otherwise have taken place had we had an all-plays-all home and away season, with a view to estimating the effect of those missing games on each team's likelihood of various ladder finishes. Firstly, here are the density charts and heat maps for the 10,000 simulations. So, what's the effect on each team? The table at left shows my assessment of each team's likely success in each of the missing games. So, for example, in the missing Adelaide v Brisbane Lions game I assess Adelaide as 77% chances of prevailing. In the columns at the far right of the table you can see the expected number of victories that I've estimated for each team in terms of the home games that it missed, the away games that it missed, and overall. Adelaide, for example, I've assessed as winning an expected 4.1 games at home, 2.3 games away, and therefore 6.3 games in total from the 11 games in missed. For most teams these lost opportunities don't mean much since they're already very likely or very unlikely to make the Finals or to finish in key positions within the Top 8, but for a few teams these missing games are crucial. In the table that follows I've recorded the probabilities for each team in relation to key ladder position finishes. The left-hand column probabilities in each section are based on simulating the remaining actual games in the current season while the right-hand column probabilities also include simulation of the missing contests. In terms of minor premiership hopes the effect of the missing games is generally small. Had we enjoyed an all-plays-all home-and-away season, Geelong would have been slightly less likely to become minor premiers, while Hawthorn would have been slightly more likely. Top 4 chances, however, are more distorted by the truncated draw, especially for Fremantle, who would have been 20% points less likely to make the Top 4 in an all-plays-all world, and for Collingwood, Essendon and Richmond, who would all have been slightly more likely to enjoy such privilege. Perhaps most important of all though, an all-plays-all 2013 draw would have given the Roos significantly more likelihood of making the Finals, Collingwood and West Coast slightly more likelihood, and Port Adelaide far less likelhood on the basis of the teams from which they were shielded by the imbalanced draw. I'll revisit this issue at the end of the home-and-away season when the impact of the missing games will be best judged.